Keywords: drained lands, peat soils, vegetative period, water consumption of forage crops, highly productive forage crops. By the results of the conducted field researches it is established that barnyard grass, amaranth and fodder beans during the vegetative period use moisture in unequal quantity, and on the volume of their water consumption it is possible to allocate three periods: I – from emergence of shoots prior to intensive growth, II – a phase of intensive accumulation of organic substance and the maximum consumption of moisture, III – from the beginning of aging and withering of leaves. During the first period of growth of culture evaporates moisture a little – 20-30% all used for vegetation, during the second period – 50-60, and at the end of vegetation – 15-20%. The maximum consumption of moisture is noticed during intensive accumulation of organic substance and it is mostly the period for the end of June, within July. It is established that the specified cultures most intensively consume moisture in phases of inflorescences formation, blossoming and at the beginning of grain maturing (62,5 % of barnyard grass; 57,3 % amaranth and 64,3% fodder beans from all water consumption for vegetation). Quantitatively it averages 45,7, 44,1 and 41,9 mm/decade respectively. Norms of total seasonal water consumption in two years of researches on the drained peat soils were the following: for barnyard grass – 366 mm, amaranth – 307 mm and fodder beans – 326 mm. It is established also that the productivity of these cultures, despite adverse climatic conditions of the vegetative periods of both years of researches (late spring frosts, high temperature of air, insufficient quantity of an atmospheric precipitation), was rather high. In particular, against the background of mineral fertilizers application N45P60K120 average yield of vegetative mass of barnyard grass is 59,5 t/hectare, amaranth — 46,0 and fodder beans — 40,5 t/hectare that makes 84,9; 86,8 and 86,9% respectively of indicators of the productivity of these cultures received in normal conditions. It allows concluding about their high adaptation ability to specific soil climatic conditions of the drained peat bogs. 1. Ryzhuk S.M., Slyusar І.T. Agroekologіchnі osnovy efektyvnogo vykorystannya osushuvanyh ґruntіv Polіssya і Lіsostepu Ukrayiny. / Kyyiv: Agrarna nauka, 2006. 424 s.
2. Ryzhuk S.M., Slyusar І.T., Vergunov V.A. / Agroekologіchnі osoblyvostі vysokoefektyvnogo vykorystannya osushuvanyh torfovyh ґruntіv Polіssya і Lіsostepu. Kyyiv: Agrarna nauka, 2002. 135 s.
3. Skrypnyk O.V., Soroka Y.S., Kubyshkyn V.P. Tehnologyya regulyrovanyya vodnogo rezhyma osushaemyh zemel. / Kyev: Urozhay, 1992. 168 s.
4. Cyupa M.G., Bystryckyy V.S., Slyusar І.T. Zemlerobstvo na osushenyh zemlyah. / Kyyiv: Urozhay, 1990. 183 s.
5. Artemenko V.Y., Beskrovnyy A.K. Selskohozyaystvennoe yspolzovanye osushennyh torfyano-bolotnyh pochv. / Kyev: Urozhay, 1972. 232 s.
6. Maslov B.S., Stankevych V.S., Chernenok V.Ya. Osushytelno-uvlazhnytelnye systemy. / Moskva: Kolos, 1973. 175 s.
7. Starykov H.N. Uvlazhnenye osushaemyh torfyanykov. / Moskva: Kolos, 1977. 296 s.
8. 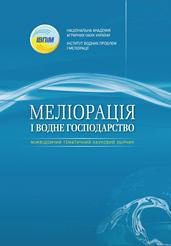 Muromcev N.A., Kovalenko P.Y., Semenov N.A. Vnutrypochvennyy vlagoobmen, vodopotreblenye y vodoobespechennost mnogoletnyh kulturnyh travostoev: monografіya. / Ryazan: FGBOU VPO RGATU, 2013. 300 s.
9. Dospehov B.A. Metodyka polevogo opyta. / Moskva: Kolos, 1973. 236 s.
10. Romaschenko M.І., Koryunenko V.M., Muromcev M.M. Rekomendacіyi z operatyvnogo kontrolyu ta upravlіnnya rezhymom zroshennya sіlskogospodarskyh kultur іz zastosuvannyam tenzіometrychnogo metodu. / Kyyiv: ІVPіM, 2012. 72 s.